Turtle Park Renovation Set to Begin in New Year | Tenleytown, D.C.
Posted on December 2, 2014 by Tenleytown, D.C. The new year will bring lots of change to the neighborhood’s beloved Friendship (Turtle) Park. In addition to an expanded toddler playground, the recreation facility will gain a play space for older children and a new community center that will be quadruple the size of the current one. Renovation is slated to begin as early as January 2015, and the D.C. Department of General Services anticipates that construction will take a year to complete. Jackie Stanley, Community Outreach Coordinator for DGS, and Ed Schmidt of the architecture firm Fanning Howey shared the latest plans for the Turtle Park renovation at a community meeting on November 12. Though a favorite haunt for AU Park and Tenleytown children and families, Turtle Park has struggled with aging play equipment, limited options for older children, and an outdated recreation center. The $5.2 million renovation seeks to remedy these issues and meet the growing needs of the neighborhood. The current 1,300 square foot recreation center will be replaced with a 5,200 square foot state of the art facility. A new community room, which will be just slightly larger than the entirety of the existing center, will be able to hold up to 125 people. Flexible dividers will allow the space to be subdivided or configured for a variety of programming. 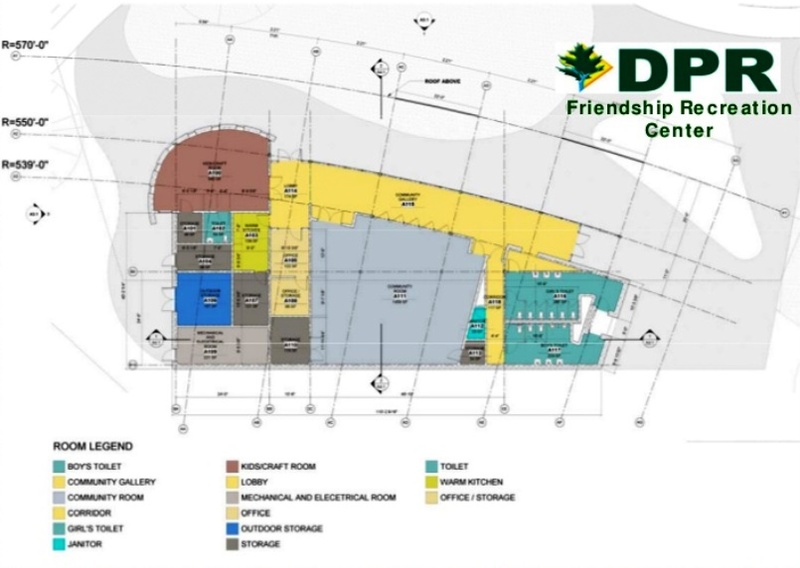 DGS intends to install a sport floor so the community room can be used for dances, dance classes, youth aerobics, or other indoor athletic activities. The front wall of the room will open onto a glass walled gallery that runs along the front of the recreation center, providing full view to the playgrounds and splash pad – but shielded from the nearby baseball fields so it won’t fall victim to an errant foul ball. A new crafts room in the recreation center will also be home to Turtle Park’s cooperative pre-school. Teachers and parents will be pleased to know that a new bathroom facility will be immediately adjacent to the learning space (there will also be restrooms accessible from the toddler playground). A warming kitchen will be included in the new recreation center for use by the cooperative and groups holding events at the center. Outside, children will be able to run, climb, and play in nearly 14,500 square feet of playgrounds. The current playground, geared toward toddlers and younger children, will grow from 6,000 square feet to 9,500 square feet, while older kids will gain a new 5,000 square foot play space. As of the November meeting, DGS and Fanning Howey were still conceptualizing the equipment for each play area, and planned to meet with community members in December to present ideas. Schmidt said he could envision a zip line, climbing wall, or similar equipment for the older kids’ playground, but wanted to hear from the community about priorities and safety concerns. DGS intends to meet with school kids, in addition to parents, from the neighborhood to get their input on the design of the play equipment. Stanley said they successfully followed a similar approach when redesigning the Lafayette Elementary School playground. While most of the planned changes at Turtle Park met with strong support from assembled community members, some residents expressed disappointment with plans to include one full-size basketball court in lieu of the current four half courts. They noted that teenagers and adults frequently used the existing courts prior to their falling into disrepair, and complained that the new court would not be sufficient to meet demand and would limit recreational outlets for teens at the park. Stanley acknowledged that DGS had received similar comments from other residents, but said that to achieve all of the community’s priorities within the available space they were only able to include the one full-size court. The new basketball court will be adjacent to the tennis courts. Parks users have similarly split over the existing baseball fields, with one contingent strongly in favor of maintaining the fields for little league games and summer baseball camps and another supportive of reclaiming some of the field space for other sports, such as soccer, or an outdoor pool. For now, supporters of the existing fields have won the day. The baseball fields will remain untouched by the planned renovation and, unlike the recreation center and playground, will remain open throughout construction.